Can’t decide which magazine to buy? Love them all? Why not subscribe to all 4? Subscribe to all 4 Magazine titles and SAVE UP TO 9.55% off the cover price. 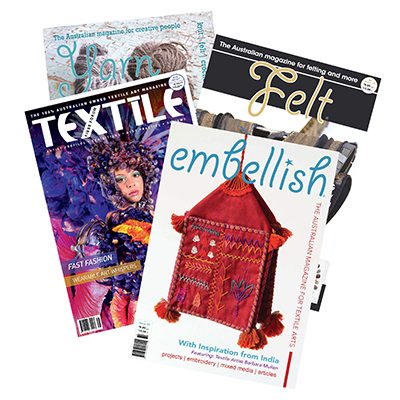 That’s 4 issues of Yarn Magazine, 4 issues of Textile Fibre Forum Magazine, and 4 issues of Embellish Magazine plus 2 issues of Felt Magazine in your letterbox, over the year!